18 This is how the birth of Jesus Christ came about: His mother Mary was pledged to be married to Joseph, but before they came together, she was found to be with child through the Holy Spirit. 19 Because Joseph her husband was a righteous man and did not want to expose her to public disgrace, he had in mind to divorce her quietly. 20 But after he had considered this, an angel of the Lord appeared to him in a dream and said, "Joseph son of David, do not be afraid to take Mary home as your wife, because what is conceived in her is from the Holy Spirit. 21 She will give birth to a son, and you are to give him the name Jesus, because he will save his people from their sins." 22 All this took place to fulfill what the Lord had said through the prophet: 23 "The virgin will be with child and will give birth to a son, and they will call him Immanuel"--which means, "God with us." 24 When Joseph woke up, he did what the angel of the Lord had commanded him and took Mary home as his wife. 25 But he had no union with her until she gave birth to a son. And he gave him the name Jesus. What a remarkable passage to ponder! We could never understand love if we didn't start with God's love for His people, though there is nothing in them that He should desire. Christ came to this earth and suffered the humility of coming as a baby, living under His earthly parent's authority, and knowing that His earthly life would end upon the cross! And, He did all this for a people who hated Him and everything He stood for. Don't ever begin to think that you became a Christian because you had any good in you, or that, as a Christian, you are better than everyone else around you. If you are a true Christian, it is because Christ picked you up in the midst of all your sin, and gave to you the breath of life, purchased by His own shed blood on the cross. What about Joseph? Joseph was a Godly man who loved his betrothed wife, Mary, very much. And yet, the unthinkable happened; she was pregnant, and it wasn't His baby! As a righteous man, he was going to divorce her quietly so she would not be subject to public disgrace. But wait, before he could follow his plan, he was visited by an angel of the Lord (verses 20 and 21) who explained that Mary is pregnant by the Holy Spirit. In obedience to God, whom he never doubted, he took Mary as his wife, and protected her (even though he never had sexual relations with her) until the birth of the baby. The virgin will be with child an will conceive and will give birth to a son, and they will call him Immanuel, God with us." 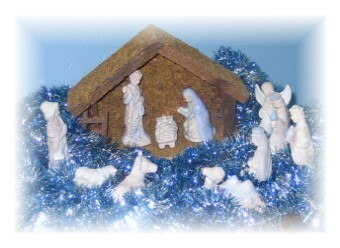 When the child was born, Joseph obediently gave Him the name Jesus. Enjoy this holiday season, but enjoy it for the right reason. No gifts we could ever give could even remotely come close to the gift of salvation brought to us through the birth of Jesus in a lowly manger in Bethlehem. In the midst of all the holiday celebrations, be sure to teach your children the only real meaning of Christmas.